We motored over to Poulsbo on Friday and spent most of Saturday there. We anchored outside the marina. While the weather wasn’t wonderful, it was pleasant enough. Very little wind left us with calm flat water. Everything was still and quiet … and gray and overcast, but still pleasant. Saturday was Flag Day*. We passed the largest vessel we have ever encountered in Liberty Bay on the way to the marina. American Cruise Line’s American Spirit was anchored in the deeper part of the bay and busy ferrying passengers to waiting buses on shore. Okay, maybe it’s not really THE most amazing salmon recipe ever, but it appears to go over well with every guest we’ve ever served it to. And before another word, I want to be sure credit for the recipe goes to the original source, which is America’s Test Kitchen. The recipe is published in their magazine. I’ve abbreviated it somewhat for here, but in all, it’s their concept. On with the recipe! 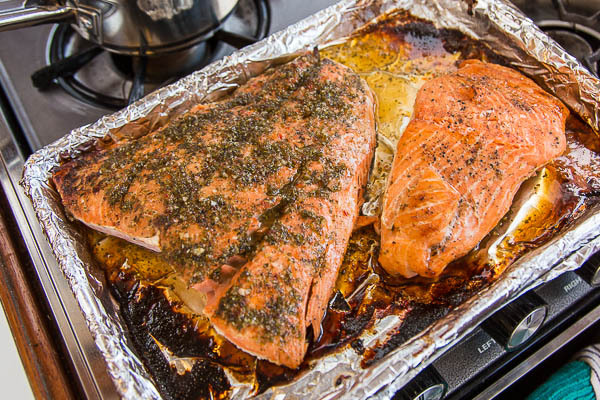 If you’re looking for an easy but amazingly flavorful way to prepare salmon while on board, look no further – excellent whether prepared by simply following the recipe or adding your own tweaks, this is almost infallible. It’s quick, it’s easy, and for us it’s become a go-to recipe on water or land!